When someone enters the back half of his or her years on Earth, it’s only natural to look back and relive the past. Especially for those who are in the grips of a decline of some sort– health, stamina, status, or any other other signifier of a life well-lived– the idea of revisiting past battles or rekindling old flames as a way to restore one’s self to former glory is nearly impossible to resist. Artists are particularly susceptible to the foibles of vanity in the face of waning influence, even more so if they’ve languished on the outskirts of relevancy for a time. 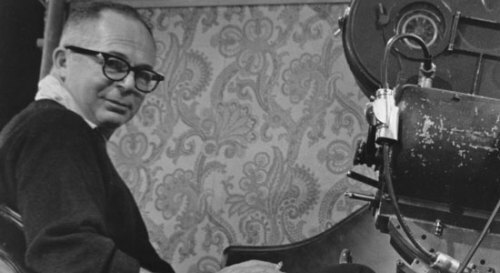 In 1957, esteemed film director Billy Wilder was just beginning his long grapple with this particularly rocky period. With a body of masterworks under his belt that anyone else would kill for, his legacy was secure, and with three features released in 1957 alone, he was more productive and relevant than ever. Nevertheless, the disappointing reception of his ambitious previous film, THE SPIRIT OF ST. LOUIS (1957), threw an unexpected rock in front of Wilder’s stride. The film’s heavy emphasis on special effects and style undoubtedly left Wilder a little breathless, so it’s understandable that he’d go back to basics for his next project. He found inspiration by revisiting the earliest stages of his career, back when he was working in the European film industry under his mentor, Ernst Lubitsch. This new project would be a throwback to his early work– a romantic comedy set in Paris, mostly adapted from a novel by Claude Anet called “Ariane, Jeune Fille Risse” (translated to Ariane, Young Russian Girl), but also drawing from an older film that Wilder had co-written for Lubitsch in the 1930’s. After experiencing a strong personal response to a Screen Writers Guild article by I.A.L Diamond, Wilder recruited the author to co-write the screenplay with him, thus beginning a long collaboration that would last for the rest of his career. The resulting film, 1957’s LOVE IN THE AFTERNOON, is unmistakably vintage Wilder, and also serves as something of a tribute to Lubitsch’s influence. For all its old-fashioned charms, however, LOVE IN THE AFTERNOON fails to recapture that particular brand of Wilder magic. The world was changing fast– peace and prosperity was giving way to conflict and chaos, and long-held social beliefs were being challenged at the institutional level– and films like LOVE IN THE AFTERNOON were suddenly feeling very outdated. Like its obliviously-creaky male lead, LOVE IN THE AFTERNOON is a relic from a bygone era– an impeccably-crafted piece of work left adrift in a new world with little use for it. LOVE IN THE AFTERNOON takes place in Paris, a setting seen throughout Wilder’s work from MAUVAISE GRAINE (1934) to SABRINA (1954). A narrator begins the story by introducing himself as Claude Chavasse (Maurice Chevalier) a kind and affectionate private investigator who is tracking the activities of a wealthy Parisian housewife to determine if she’s being unfaithful to her husband, Monsieur X (played gamely by John McGiver in a perpetual state of heartburn). Claude works out of his apartment, which he shares with his young daughter Ariane (Audrey Hepburn in her second collaboration with Wilder). Ariane is an aspiring celloist, but she also takes a great deal of interest in her father’s work, often sneaking peeks at his files while he’s away. Hepburn plays very much into her classical type here as an inquisitive romantic, an innocent dreamer who can’t help but fall for Frank Flannagan (Gary Cooper), the handsome American oil tycoon seen canoodling with Monsieur X’s wife in her father’s surveillance photos. When she overhears Monsieur X’s plot to catch his wife in the act and shoot them both dead, she sneaks away to Flannagan’s suite at the Hotel Ritz to warn the secret lovers about their impending demise. She successfully foils Monsieur X’s plot, only to wind up the target of Flannagan’s amorous advances herself. On paper, Cooper might seem a good fit for the sophisticated, worldly millionaire bachelor with lovers all around the world, but his performance in LOVE IN THE AFTERNOON leaves a lot to be desired. His performance lacks charisma, and is hampered by his readily apparent age– indeed, a great deal of disbelief must be suspended in order to believe the glamorous and virginal Hepburn would have romantic feelings for him. Cooper’s insistent advances on Hepburn read as creepy and predatory, not romantic as Wilder probably intended. Nevertheless, the story must continue, and Ariane continues to visit Flannagan at his suite in the ensuing afternoons, letting him woo her while keeping him at arm’s length. When he asks her about her former lovers, Ariane’s anxiety about his carnal experience causes her to compile an imaginary list of suitors drawn from her father’s various dossiers. In a fine illustration of the era’s double standards, Flannagan is tormented at the thought of Ariane matching his number of sexual partners, so he decides to hire the best private investigator in town to look into her history. Of course, that PI is Ariane’s father, who quickly figures out that he’s been tasked with investigating his own daughter and must navigate the needs of his client without breaking her heart. The old-school narrative approach also applies to LOVE IN THE AFTERNOON’s cinematography, executed faithfully by first-time Wilder DP William C. Mellor. The film echoes SABRINA’s aesthetic by shooting on 35mm monochromatic film stock in the widescreen 1.85:1 aspect ratio, adopting a high contrast lighting setup that combines the hard edges of the noir genre with the soft glamor of romantic comedy. Curiously, Wilder shoots the scenes of Flannagan seducing Ariane in his hotel suite in near-silhouette. Considering that most polished studio pictures of this era and genre would opt for the clarity of broad lighting, Wilder’s choice to throw his two stars in heavy shadow reads very much as intentional– a reflection of the murky morality of their rendezvous. LOVE IN THE AFTERNOON also sees a return to Wilder’s trademark technical minimalism after the comparatively frenetic approach to THE SPIRIT OF ST. LOUIS. While his compositions aren’t exactly visceral, they are extremely precise– each shot is lined up to tell the maximum amount of story with a minimal expenditure of time and energy. Take for instance, a scene where Ariane talks with Flannagan on the balcony of his hotel suite: it’s a fairly standard dialogue scene that most filmmakers would choose to cover with alternating over-the-shoulder setups. However, Wilder places the camera’s focus firmly on Ariane, while Flannagan appears in a glass reflection behind her (and in the position he’d be oriented in for the expected reverse shot, no less). Because both subjects appear clearly within a single shot, Wilder eliminates the need for coverage while losing nothing in the translation. For the most part, Wilder cuts to additional coverage only when necessary, preferring instead to reframe his compositions in-shot via fluid camera moves or punchy whip-pans– the motivation for which come only from the needs of character and story, and not from the desire to showcase technical ability. If LOVE IN THE AFTERNOON’s cinematography harkens back to SABRINA, its production design draws its influence from even deeper within Wilder’s filmography: his first film, MAUVAISE GRAINE. Once he’d attained the status of a major Hollywood director, Wilder consistently opted for the control and luxuries afforded by shooting on a soundstage– but like the generation of directors he’d later influence, Wilder got his start shooting guerrilla-style in the streets. LOVE IN THE AFTERNOON finds Wilder back out on the blocks of Paris once more, this time with considerably more resources at his disposal. While he didn’t abandon soundstage shooting entirely in this instance, Wilder nevertheless establishes a palpable sense of place with the footage he procured on location. His embrace of the immediacy and unpredictability of urban life is also reflected in the film’s soundtrack as a clash of varying sounds and tastes. Longtime musical collaborator Franz Waxman provides a traditional, romantic score, but Wilder also incorporates a heavy mishmash of pre-existing tracks consisting of classical orchestral suites, European pop ballads and rambunctious Gypsy folk songs. LOVE IN THE AFTERNOON is the latest entry in Wilder’s long tradition of using his pointed wit to dance around censorship. His films might seem quaint and tame by today’s standards, but his stories were truly transgressive in their day. LOVE IN THE AFTERNOON bills itself as a romantic comedy, but it’s really about selfish, delusional lust instead of wholesome love– at least on Flannagan’s part, as Ariane can’t help but be swept up in the empty grandeur of it all. The kind of love that’s explored here is inherently cynical, hidden away in discrete hotel rooms and declaring itself in hushed, furtive tones. It is the realm of adulterers and fornicators, not lovers. As evidenced by a prologue of couples publicly making out all over Paris, Wilder depicts these affairs as an institutional given– a commonly accepted practice that evokes the old French platitude that a man has three women in his life: his wife, his girlfriend, and his mistress. While Wilder had previously managed to skirt around the prudish demands of the censors, he was ultimately compelled to oblige the Catholic Legion of Decency’s objections to his original ending, which would have seen Ariane and Flannagan ride off into the sunset to begin a proper courtship. He doesn’t technically change anything, save for a tacked-on voiceover narration that explains that the couple are now married and living happily in New York– an unnecessary addition that undermines and trivializes Wilder’s original message. 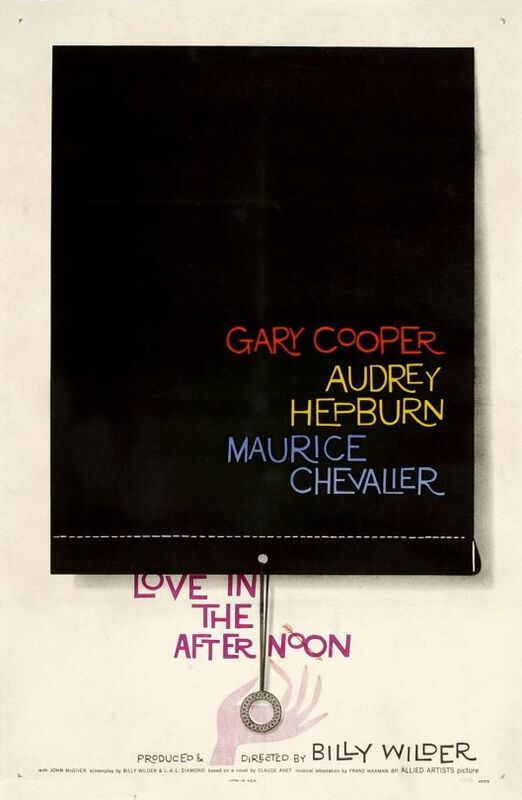 Wilder’s core thematic signatures are well represented in LOVE IN THE AFTERNOON. His characters tend to identify themselves primarily by their line of work, and it’s typically their jobs that inform their moral anchor (or lack thereof). Claude’s career as a private eye and Ariane’s study of the cello establish something of a baseline for their worldview, with the former being pragmatic and insightful while the latter is sensitive and idealistic. By contrast, Cooper’s Frank Flannagan’s wealth from his oil empire removes the need to work, so we don’t ever actually see him working. Instead, we only see him wooing a parade of women in his hotel suite. His dissociation from his profession leaves him without a set of central principles to adhere to, casting him morally adrift. This divide between the Chavasses and Flannagan also illustrates Wilder’s interest in class distinction. The cramped apartment that Claude and Ariane share might as well be a shoebox compared to Flannagan’s palatial hotel suite. As in the best love stories, the two paramours come from entirely different worlds– Ariane’s ascent into the upper class is reflective of Wilder’s earnest belief in the American ideal that, with a lot of work and a little luck, even the lowliest person can hoist themselves up the socioeconomic ladder. Because film is primarily a visual medium, Wilder uses the shorthand of uniform to further convey these ideas about class and profession. He serves up several examples throughout the film: the starched elegance of the suited Hotel Ritz staff, the sartorial decorum of police officers, or even the matching tuxedos of the gypsy band. Even Flannagan, a man with no need for a specialized uniform, adopts a white dinner jacket as a recurring signifier of his status. LOVE IN THE AFTERNOON finds Wilder returning to his roots in a bid to reconnect with his audience, but that audience (and the world) had changed dramatically in the intervening years. The film was a commercial and critical disaster in America, with critics singling Cooper out as woefully miscast for the part. They spilled so much ink on his visibly-ailing health that Cooper subsequently underwent a full facelift. The film fared much better in Europe, where it was released under the title ARIANE. Unlike some of Wilder’s other minor works, LOVE IN THE AFTERNOON has not grown in esteem in the years since. By all accounts, Wilder is working firmly in his directorial wheelhouse and playing every aspect of the story to his strengths– but something about the whole endeavor seems off the mark. It lacks the simple timelessness of his best work. The artistic flabbiness that would mar the twilight of his career is readily apparent here in its earliest stages. IfLOVE IN THE AFTERNOON is notable for anything within his filmography, it’s that the house that Wilder built is starting to show its age. Wilder still had some great films left in him, but the black mold of decline was already seeping through to the surface– a sign of the slow decay happening underneath. LOVE IN THE AFTERNOON is currently available on standard definition DVD via Warner Brothers.